But then I went to the web site. www.zlynn.com and I thought, hey, these are cool authentic Chinese water craft, done in a traditional way from a family that has been doing this for 5 generations…. 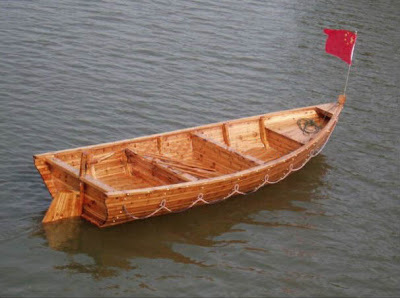 From a town that is known as the Wooden Boat Building Town in China…..Zuheng Town….Hey wait a minute, they get it! In-fact maybe it’s us that don’t get it, since they have been around a gillion years longer than us even as a country, maybe they know something we don’t. Maybe I should have an open mind and welcome anyone out there in the world that believes in preserving traditions and staying true to ones history, that’s what Woody Boating is all about.. Right? Zuheng Town would be a cool sister City to Woodyboaterville… Maybe my humor is wrong, maybe I need to grow up and expand my mind… Wait! There are no flat head or hemi motors on these. What the hell…. Row boats and tour boats. Ohhhh crap! I have been sucked in by a taxi boat bus maker. Ohhh Chee Man… But, it would be cool to own a Junk though…..I wonder what happens if you mix a little MSG into some varnish? Jim Gorden Wants To Find His Family Boat! Can You Help? Amazing what you can do with 32,000 varnished chopsticks!